With GSE Colour connect, our software can interface with colour formulation software from different suppliers, like Datacolor and X-rite. With this optional interface, the worlds of ink management and colour management integrate, bringing you a host of extra benefits. New colours can be created with colour formulation software and the new formula can be imported directly into GSE Ink manager. A button on the dispense screen makes this process child’s play. The colour correction process can be supported by ink formulation software as well. The operator takes a proof, measures the colour using CIELAB coordinates and, if the colours fall outside the required Delta-E parameters, the software makes a suggestion to correct the recipe. 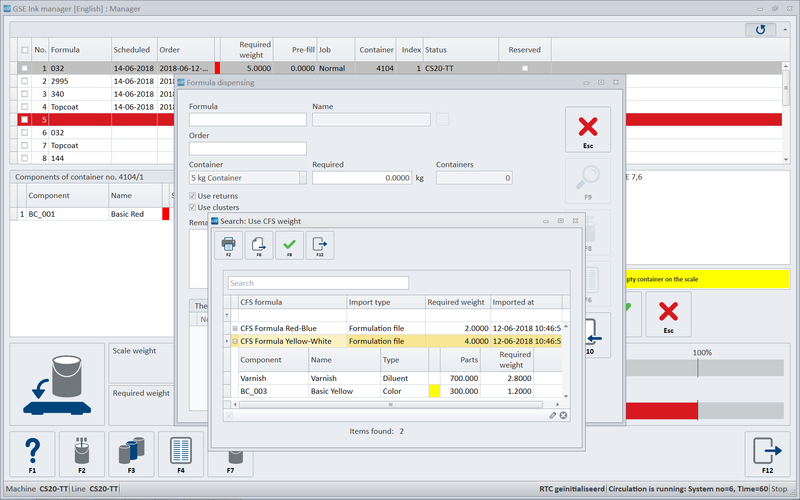 The corrected formula is imported to GSE Ink manager and you can dispense a batch again. The colour is measured and, if correct, the adjusted formula will be stored and the job goes to press. Leftovers, or press return inks, can account for up to one third of the amount of dispensed ink. Our ink management software allows these inks to be recycled into new recipes. As an example, press returns of Coca-Cola red could obviously be recycled into a new batch of that special colour. But, since we know the recipe of the colour – this Coca-Cola red consists of maybe warm red with some yellow and orange – we can use this for making a completely different colour with the same base ingredients, like a Nestlé orange. The software guides the operator through this process. Another way of working is to collect the return inks in ‘Clusters’ of colors. GSE Ink manager can for example help to collect all the blue return inks with the same base ingredients. The collected inks will be thrown in a large container (e.g. a 200-litre vessel) and colour formulation software can determine the formula of this blue ‘cluster’ ink (or determine several formulas, creating different ‘indices’ for this cluster). The collection vessel is connected to the dosing system as an additional component. This helps you to recycle those return inks automatically, without retrieving every separate bucket from the returns storage. Contact us to learn more about integrated colour management.